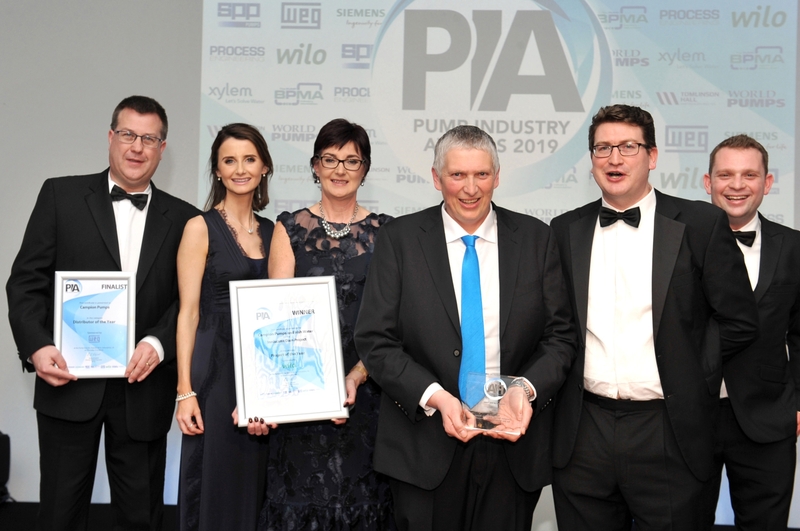 Campion Pumps and Irish Water have been awarded Project of the Year in the Pump Industry Awards for specialist engineering works carried out at Inniscarra Dam. Campion Pumps, which demonstrated superior engineering performance, was recognised at an award’s gala dinner in the UK on March 21. The awards are regarded as one of the leading industrial events with the “Project of the Year” title awarded for the most innovative pump project, installation or service introduced onto the market. The Pump Industry Awards recognises pump and pump related companies across the UK and Ireland which are operating at the highest levels of engineering performance. As the only Irish finalist Campion Pumps from Gortnahoe have been recognised for their engineering ingenuity. After a rigorous judging process and public voting, Campion Pumps and Irish Water were announced winner of Project of the Year category and Campions Pumps as one of three finalists for Distributor of the Year. Campions Pumps celebrated 30 years in business last year. Founded by local man Martin Campion, and with over 50 employees, Campion Pumps are leading providers of water and waste water pumping solutions and bespoke booster sets in Ireland. Providing a full range of pumping and treatment solutions to commercial, industrial, agricultural and domestic customers and they are now preparing to bring Scadacloud monitoring and IoT services to market in UK and across Europe. The project receiving this outstanding recognition was carried out in the summer of 2018, which will be remembered as one of Ireland’s hottest and driest. The exceptionally dry weather reduced water levels to varying degrees across the country and, in turn, affected the ability for Irish Water to abstract sufficient quantities to meet demand. The impact of severe drought was kicking in. The met station at Cork Airport, for example, recorded the lowest level of rainfall since 1962 for the combined months of June, July and August. This lack of rainfall during the summer reduced the reservoir at Inniscarra to levels not previously recorded in the history of the Cork Harbour & City water supply scheme. The Inniscarra water treatment plant was constructed in the 1970s and is the third largest such facility in the country, producing approximately 60 million litres per day. This serves about half the needs of Cork City and surrounding areas, with plants at Lee Road and Glashaboy providing a further 40 million and 20 million litres per day respectively. As the water level in the impoundment dropped below critical levels, it became clear that the water would have to be moved around the dam to keep the river flowing. To tackle the problem, Irish Water engaged Campion Pumps to implement an effective solution. Campion Pumps, working for and with Irish Water, designed a floating pump arrangement. Discharging directly into an opening in the centre of the dam, an opening normally used to pass fish. When the concept was developed, a team of specialist engineers was assembled, Campion Pumps, Gleeson Steel & Engineering, also from Gortnahoe, and WH Scott and preparations took place during the last week of July and over a busy August bank holiday weekend. A 16-tonne steel plate pontoon was sourced, and a team of specialist engineers got to work at Campions headquarters in Gortnahoe, Co. Tipperary. Three pumps to cater for high flow at low head were selected by our in-house pump experts. A steel frame was designed. Fabricated and certified to sit on the pontoon and hold the pumps in position. Within a two-week period, the elements were brought together and lifted into the water at Inniscarra to be floated into position at the centre of the dam with the assistance of Subsea Marine and East Cork Crane Hire. Three 12-inch delivery pipework were passed through the opening and the pontoon was secured using four anchor points that had been drilled into the upstream face of the dam. A 300kVA diesel generator provided the power and with soft starts and control panels in place for remote monitoring, the pumps were commissioned. The system remained in place for 6 weeks. In providing this contingency arrangement, continued access to raw water at Inniscarra was guaranteed and the downstream river continued to flow. Campion Pumps provided online Scada monitoring and alarm services of the site with full visual representation via the Scada platform. This allowed the various stakeholders to monitor pump runs, volume of water pump, operational status of system and remote access to engage/disengage pump system. Maintaining flow in the channel downstream of the hydroelectric dam was vital for the health of the river and to sustain fish life. It also ensures adequate supply of raw water to the downstream water treatment plant at Lee Road. Continued access to raw water at the Inniscarra treatment plant was facilitated. This maintained the overall water supplies to Cork city and surrounding areas with a population of 250,000 plus significant industry remaining unaffected.